For nearly a year, since I began the first work on the book, Saturday has slipped into being my 'work' day. The day I get up, have breakfast with the babes and Steve, and then head all the way up the stairs (ha!) to my studio for a day of work. 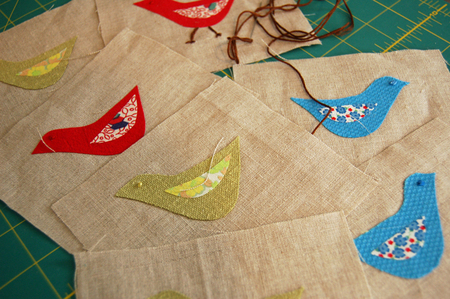 Writing, sometimes thrifting, sewing, and making things. There are many interruptions of the lovely kind ("Mama! I made this for you!" or "I brought you a snack! "), and some of the more challenging kind (a lovely little technique that apparently all persistent and clever little ones employ - when you don't get the answer you're looking for from one parent, just ask the other! Steve and I call this 'staff splitting,' and are quite entertained when we've been duped). I've come to love and treasure this studio day, and usually know just what I'll do in there before my time even begins. This weekend I worked on a new design for the shop that I'm really excited about. You can see a snippet of it above. But I ran out of photographing time, so I'm moving the shop update back a day this week. The update will happen on Wednesday morning. I love the weekly rhythm of my studio day, and I love the little routines and rituals that have fallen into place through the day, as well. It almost always begins with blog catch up from the week (I read just a handful each day, but save most for this weekend read), followed by music (in heavy rotation this month are this, this and this) and tidying the studio to get ready to work. 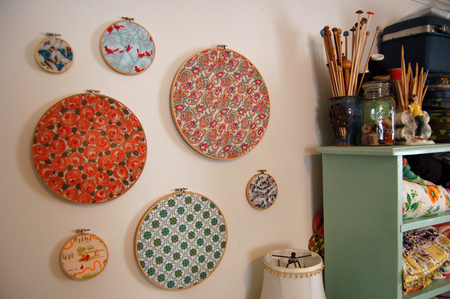 This weekend, when I saw The Purl Bee's post and tutorial for "swatch portraits', it didn't take long for me to dig out all the wood embroidery hoops I had and get to work making my own for a small part of my studio wall, before I began any other work. I love this idea (I'm guessing I'm not alone - will we see more of these this week in blog world?). 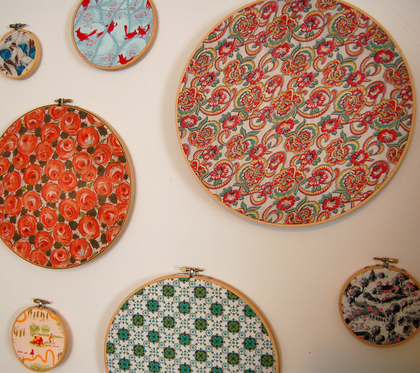 I quickly ran out of embroidery hoops before I ran out of wall space and 'favorite' fabrics to use, but that will be remedied quickly at my next thrift outing to be sure (did you know that my local chain craft store doesn't carry wood embroidery hoops anymore - just plastic? A shame). I'm so inspired by some of my favorite pieces of fabric, and keeping them visible like this keeps the inspiration right in sight, and fresh in the mind. Happiness.